Ameya Pawar appears on Chicago Tonight in April. Chicago Ald. 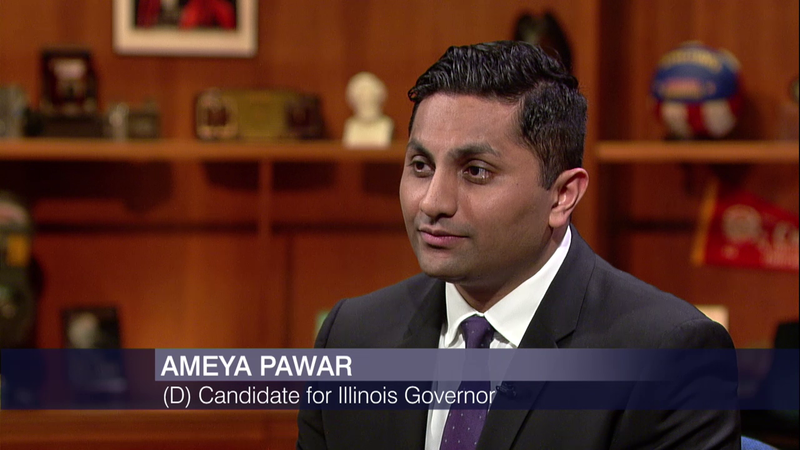 Ameya Pawar is ending his bid for Illinois governor, saying he came too short in the race for cash to have a chance at winning the contest for the Democratic nomination. Pawar reported raising $335,980 in the last quarter, which ended Sept. 30, bringing his fundraising total to $769,542. Hyatt hotel chain heir J.B. Pritzker, a venture capitalist, is widely seen as the front-runner in the crowded primary field. Last weekend, the Illinois Democratic County Chairmen Association – a group with ties to House Speaker and Illinois Democratic Party Chairman Michael Madigan, and a group whose members can play a key role in getting out the vote in their local areas – endorsed Pritzker. He also won the endorsement of Cook County Democrats in August and is backed by the AFL-CIO union coalition. Pritzker is taking no campaign contributions, but has self-funded his campaign thus far to the tune of $28 million – money that he’s using to open field offices statewide, to beef up staff and to blanket television screens with ads. Republican Gov. Bruce Rauner, a former private equity investor, largely bankrolled his inaugural campaign in 2014 and is on pace to do the same as he seeks re-election in the 2018 cycle. Rauner is also the primary funder of the Illinois Republican Party. Rauner’s “Citizens for Rauner, Inc.” has raised more than $71 million. Pawar’s exit could shake up the race, however, particularly if he endorses one of the other candidates. Pawar, state Sen. Daniel Biss (D-Evanston) and businessman Chris Kennedy, the son of the late U.S. Sen. Robert F. Kennedy, have been battling to win over progressive voters and Democrats wary of the party flocking to a candidate like Pritzker, whose most distinctive bona fides – a billionaire with no experience holding public office – matches Rauner’s. Biss’ campaign has raised over $3 million and Kennedy’s campaign reports having roughly $3.4 million. Madison County Superintendent of Schools Bob Daiber, Chicago anti-violence activist Tio Hardiman and suburban businessman Alex Paterakis are seeking to run as Democrats on the March 20 primary ballot. Pawar, who represents the 47th Ward, says he’s launching One Illinois, a new political action committee (PAC) for young progressives “to organize young people around progressive issues and fight the false and bigoted divides around race, class, and geography.” He promised more in coming weeks. “I knew that speaking about my own progressive ideas and policies was a risk. When billionaires who own football teams are so afraid of public opprobrium that they say nothing while national politicians vilify their employees for unobtrusively exercising their rights, believe me, I realize that condemning the War on Drugs as a war on black and brown families is going to raise some hackles. But I got into public service speaking my mind when nobody cared what I had to say, and by now all I know how to do is be myself,” Pawar wrote in his exit letter. Oct. 4: The suburban lawmaker is considering getting in the race, citing her frustration with the governor's signing of HB40. Sept. 7: Political intrigue and high finance mark the race for governor. April 4: The Chicago alderman joins host Eddie Arruza to discuss his run for Illinois governor.